If the trademark of the Mouseman needs little in the way of introduction, then its author probably does. Robert 'Mousey' Thompson was born in Kilburn in North Yorkshire in 1876, the son of the village's jobbing carpenter and stonemason. But he had ambition for the family business. 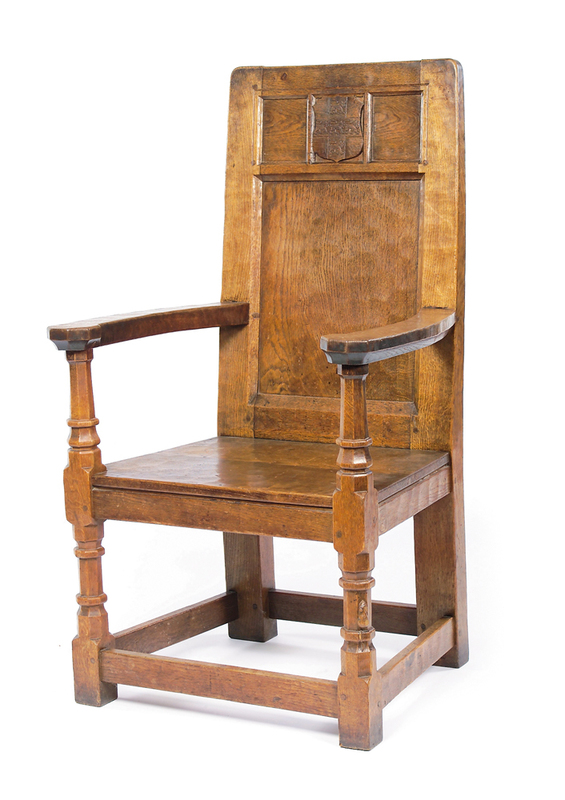 Inspired by the splendid medieval carvings at Ripon Cathedral, Thompson began experimenting with his own ideas for producing furniture in the British vernacular tradition. 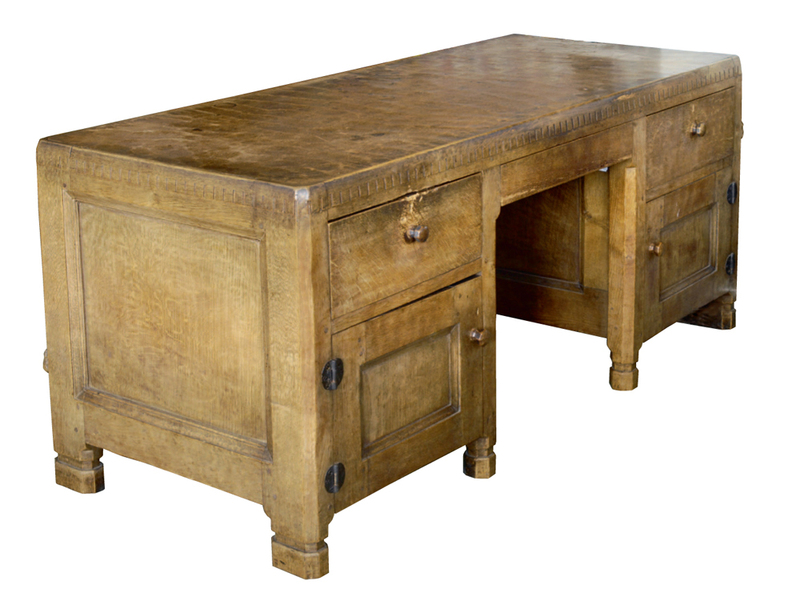 Eschewing the modern tools of an industrial revolution, he embraced the mortise and tenon joint dowelled for strength and mastered the adze as a tool for shaping and smoothing surfaces that gave his furniture its distinctive rippled appearance. 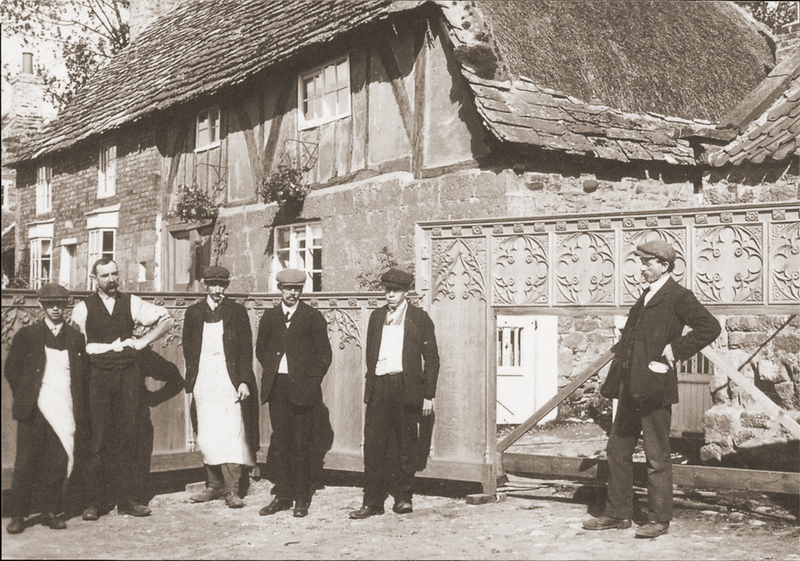 Robert Thompson “The Mouseman of Kilburn” (far right) and his fellow craftsmen with an example of early church work. The picture was taken in 1911. The Mouseman Visitor Centre – reopened in April 1994 following a £500,000, two-year restoration programme – occupies Thompson’s workshop and adjoining blacksmith’s shop. Thompson accepted his first major commission in 1919 from Ampleforth College and here in the early 1920s he would hit upon his trademark. "The origin of the mouse as my mark was almost in the way of being an accident. I and another carver were carving a huge cornice for a screen and he happened to say something about being as poor as a church mouse. I said I will carve a mouse here and did so, and then it struck me, what a lovely trademark." The mouse (each one took 45 minutes to carve) signifies 'industry in quiet places' and was finally registered as a trademark in the 1930s. By then Thompson had 30 men working for him and the first of the 'critters' - the mouseman imitators, had emerged. 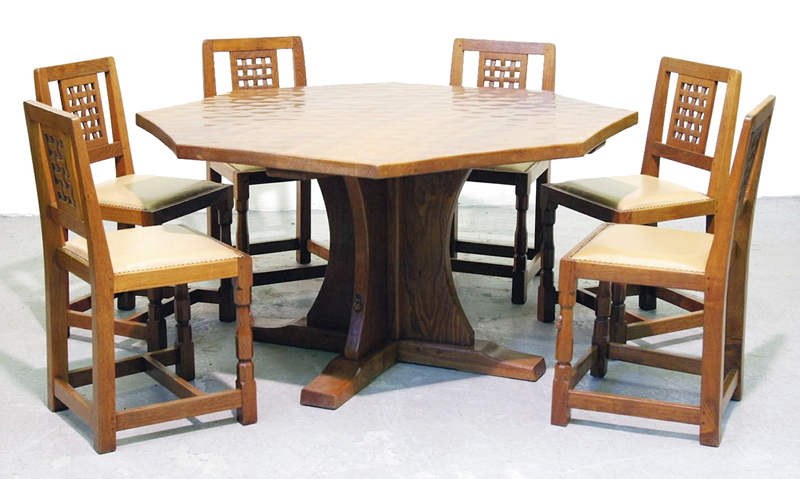 One man's work from start to finish remains the ethos at the family firm of Robert Thompson's Craftsmen Ltd, still manufacturing oak furniture in Kilburn, Yorkshire using the same traditional techniques and skills. If his story is the epitome of the Arts and Crafts ethos, then perversely Thompson is not taken terribly seriously by Arts and Crafts aficionados who deem his work to be derivative and out of period. But the public have taken him to their hearts. There has long been a strong local support - and the auction rooms of Yorkshire remain the primary source of supply - but, with a growing fan base in North America and the Far East, Mouseman now has an international following. 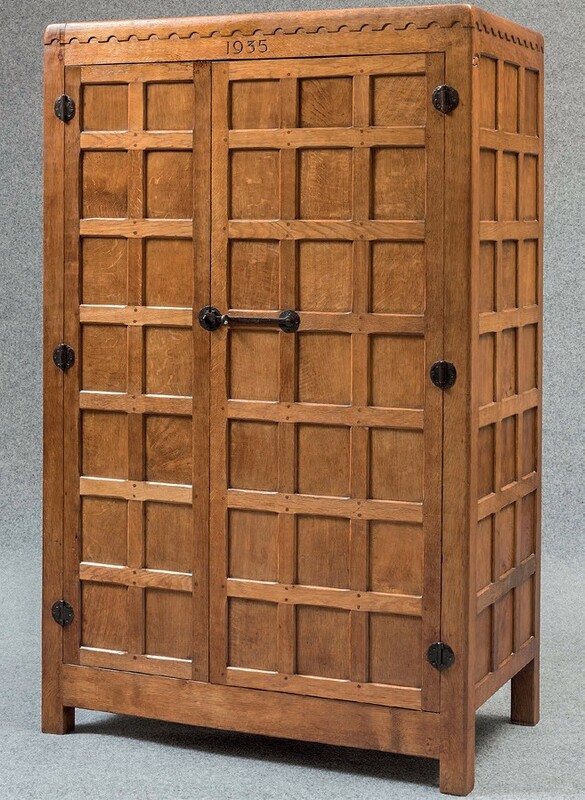 Sotheby's New York hold the auction record for Mouseman furniture - $70,000 (£40,460) for a distinctive two-section cupboard c.1923 with elaborate ironwork by the Kirkby Moorside blacksmith Will Dawson. Sotheby’s hold the auction record for Mouseman. 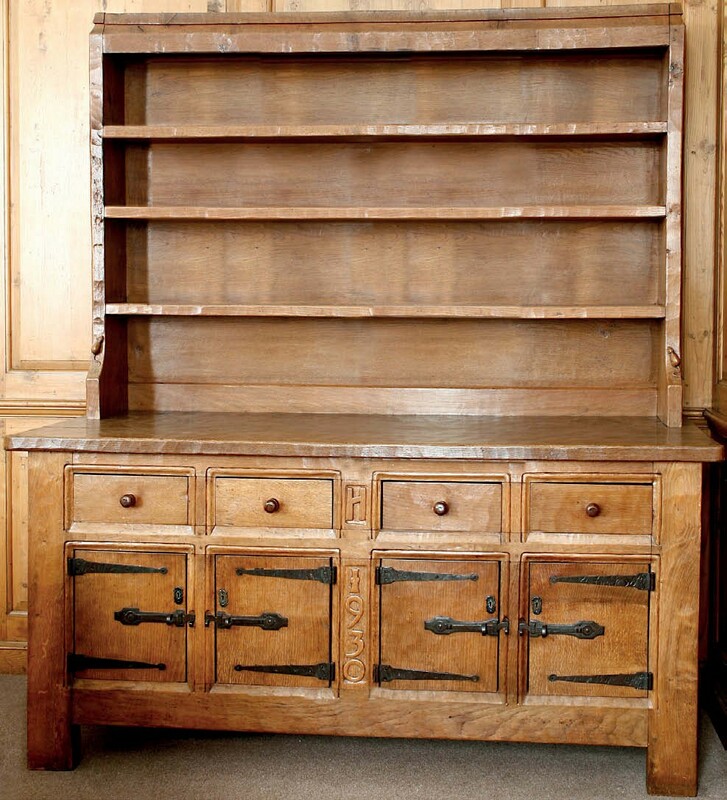 This two-section oak cupboard, which measures 7ft x 5ft 6in x 2ft 6in (2.1m x 1.7m x 76cm), was offered for sale in New York on December 2003 as part of the collection of predominantly French post-War decorative arts formed by the fashion designer Wolfgang Joop. 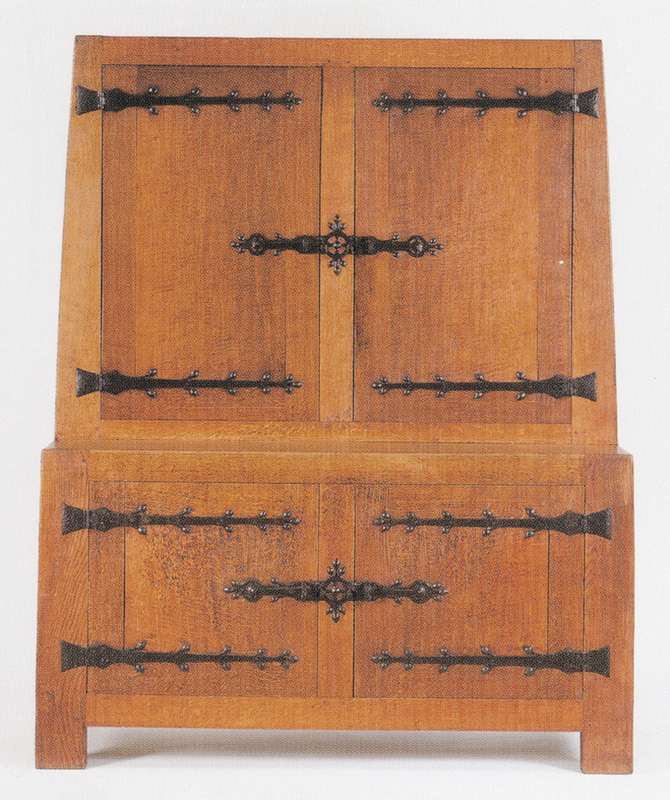 The cabinet (workshop photos of it still survive in the Kilburn archive) carries two hand-written labels to the interior, one inscribed with the date 1923, the other for Will Dawson, the Kirkby Moorside blacksmith who provided the elaborate iron hinges. To the back left edge is a very early use of Thompson’s trademark mouse signature. Although estimated at just $4000-6000, it sold to a New York decorator at a massive $70,000 (£40,460). The price remains far above anything ever seen before or since for the Mouseman of Kilburn. Date is the key to the pricing structure. It's pretty straightforward really. The earlier the piece, the closer it will be to the original design and the better its colour and patination. 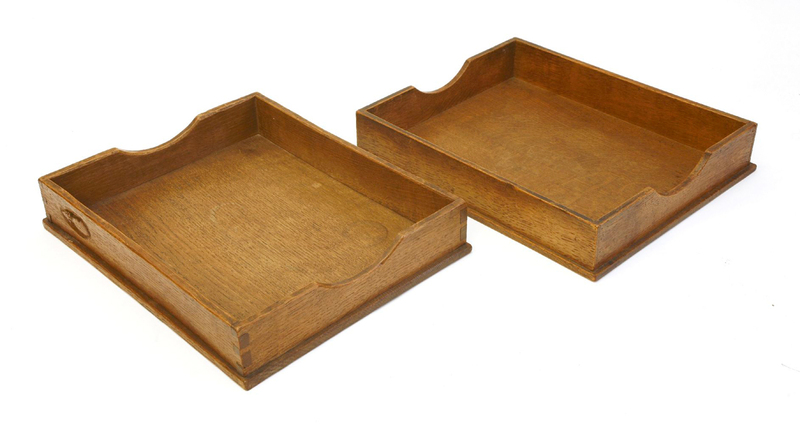 Many collectors want pieces dating from the Robert Thompson era (pre- 1955). There's no guarantee that they will have been his handiwork but they were made under his tutelage. However, items from the late 1950s and 60s are starting to acquire pleasing signs of age, and there are attractive forms from this period that are no longer in general production. As a general rule, however, post-1955 Mouseman will cost roughly half of what it costs to buy a newly manufactured piece. So many old designs remain in production that shape and form rarely give a clue to the date of a piece. 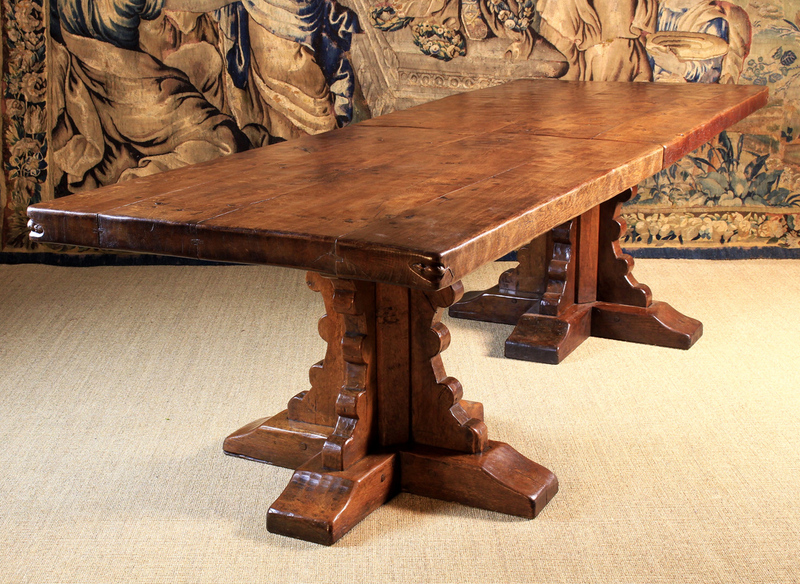 It is something of a bugbear for the current custodians of the family firm of Robert Thompson's Craftsmen Ltd that Mouseman furniture and domestic objects are frequently offered for sale as vintage when details of construction suggest otherwise. Here are a few general tips. A good clue to the date is the signature - the earliest mice have front paws that were prone to breaking. 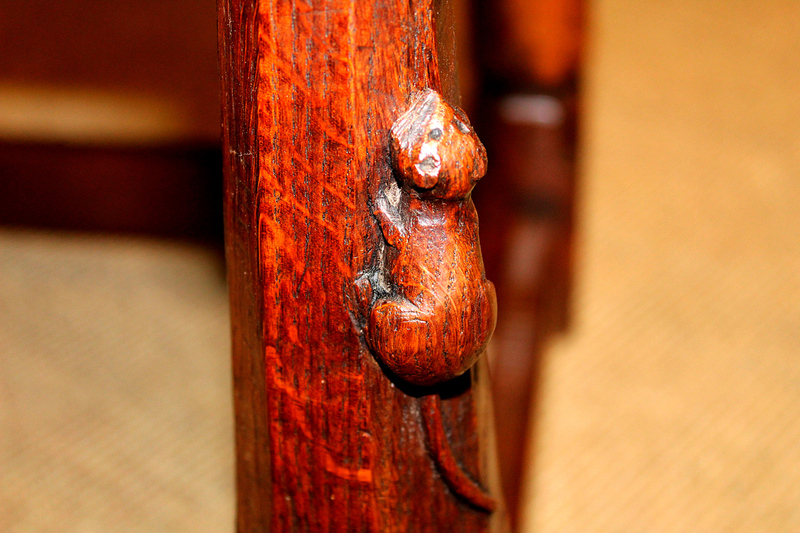 You will see them on domestic furniture from the 1920s into the 30s before a cuter little chap, without paws, makes his debut in the 1930s. It's not an exact science: if the client wanted them the paws remained, and just to complicate matters further the paws stayed on some pieces of ecclesiastical furniture. There are also a small number of very early Thomson pieces that do not have the mouse signature at all. Construction details give important clues. Look closely at table tops (they were dowelled rather than tongued and grooved until the early 1970s) or underneath a chair where the position of the 'rush rail' was changed in the mid 1950s. It was thought preferable to position the rail, formerly mortised and tenoned to the front legs, a few inches back. It's a simple but effective rule to remember. 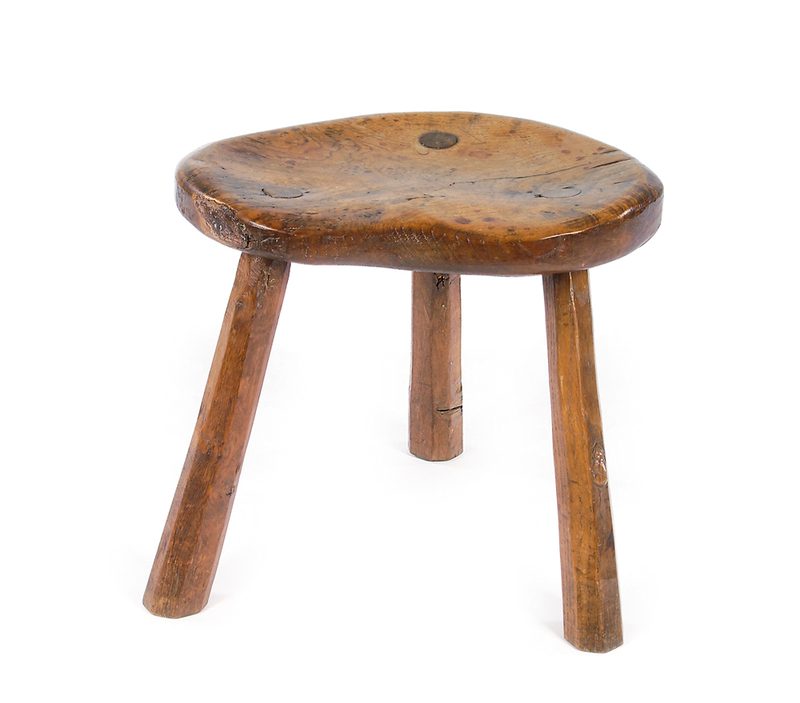 Early chairs have solid panel backs and legs that were turned on a lathe and then worked on a bench to form their distinctive octagonal shape. They will often retain the telltale 'prop' marks where they were held in the lathe. 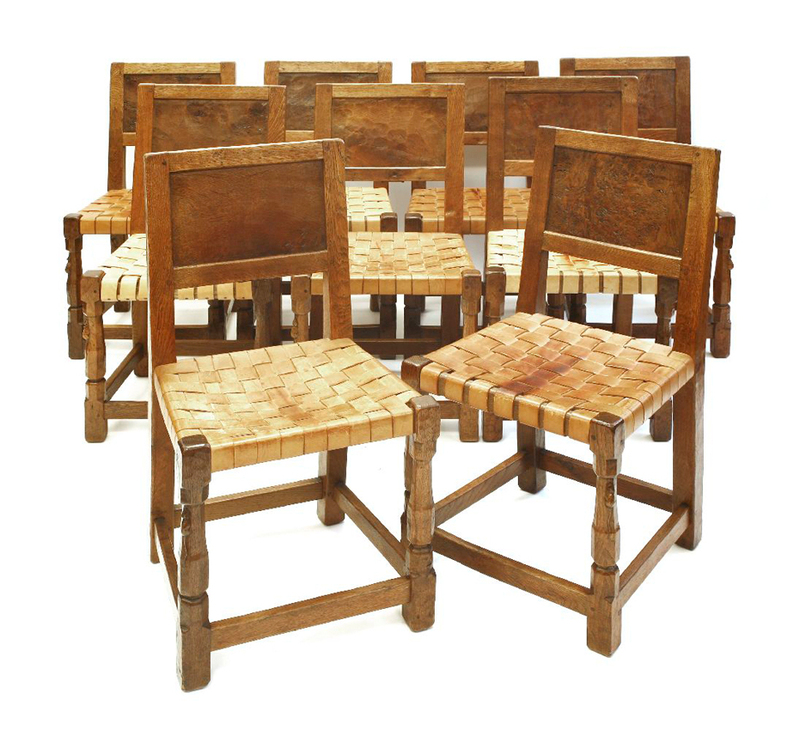 The classic lattice back chairs were not made until the end of the 1930s. The earliest form of upholstery was interwoven leather (1920s and 30s) followed by slung seats using solid leather seats (until the 1950s) and then the fully upholstered seats with cotton web frames and cowhide that are still in production today. The first screws used for attaching ironwork were handmade with a square slot. They were replaced with crosshead screws and then with the flat head screws still used today. Earlier cheeseboards feature a mouse on the board. From the 1960s the mouse was repositioned on the handle to provide more strength. A mouse in the centre of a fruit bowl suggests it was made after the 1960s. Before then the rodent sat on the side of the bowl. Earlier cheeseboards feature a mouse on the board. 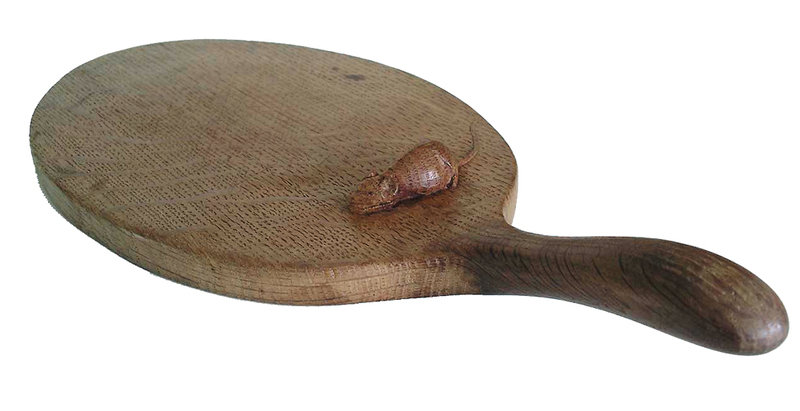 This 14.5in (37cm) Mouseman cheeseboard dates from c.1950. Image from dealer Paul Ing. It is doubtless down to the success of Robert Thompson that Yorkshire's North Riding has become something of a centre for handmade furniture. Workshops sprang up in surrounding villages as former employees set up shop on their own, many choosing to use another small creature or motif as a signature. From rabbits to beavers, some 30 'critters' have been identified, of which roughly half were former Kilburn workers. It is the spiralling cost of Mouseman furniture that offers the best reason for hunting down the work of his followers - as a general rule it costs roughly half the price of the real thing. The signature of Tom ‘Gnomeman’ Whittaker of Littlebeck, near Whitby. It's generally technically proficient rather than outstanding, but two names in particular can offer comparable quality (coincidentally neither of them former Thompson employees). 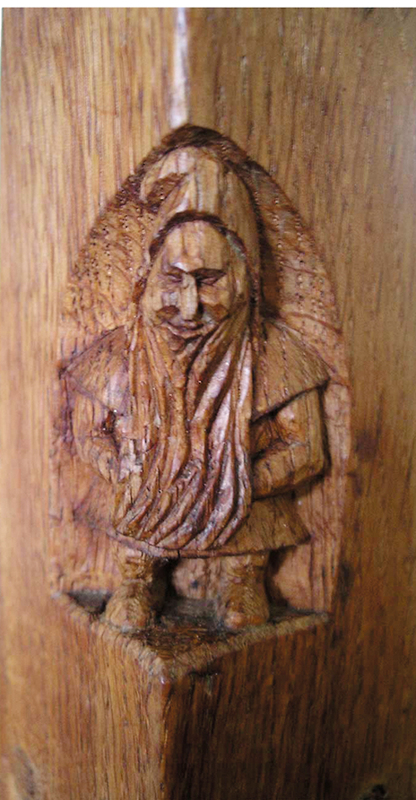 These are Tom 'Gnomeman' Whittaker of Littlebeck, near Whitby, and 'Kingpost', an enigmatic figure (whose work lacks a signature but sometimes carries an ivorine plaque) who was educated at Ampleforth College where Robert Thompson received his first major commission.